THE year 1869 was a fateful one in the history of railroads. It was during that year that George Stephenson won the “Battle of the Gauges” over his opponent Brunei, the famous engineer of the Great. Western Railways. This “victory,” which decided in favor of the narrower gauge of 4 feet 8-1/2 inches, was a fundamental error. From it stem practically all the ills of the present-day railroads. Greater speed, cost of operation, volume, comfort, loads, economyâ€” every possible progressive step needed today is prevented by the initial shortsighted decision won by Stephenson. History is not clear as to how the odd figure of 4 feet 8-1/2 inches was arrived at. Some say it was based upon the distance beteen the Romans’ wheel ruts. Others claim that Stephenson simply found it in the distance between the wheels of his own cart. Brunei’s original design for the track of the G. W. R. was 7 feet, and when the fateful decision was made 1,500 miles of broad gauge was already in existence. Brunei had obviously visualized future progress of rail transportation and claimed rightly at the time that by using his wide gauge he was able to have a more powerful locomotive and therefore greater speeds, loads, service and economies. The narrower gauge of 4 feet 8-1/2 inches has stuck. It is today the international standard used all over the world, with the exception of a few countries who have a wider gauge, such as Spain and Portugal with gauges of 5 feet 5-3/4 inches, Russia largely with 5 feet, Eire with 5 feet, and the main lines of India with 5 feet 6 inches. With this narrow track railroad engineers have already attained the maximum of possible results. 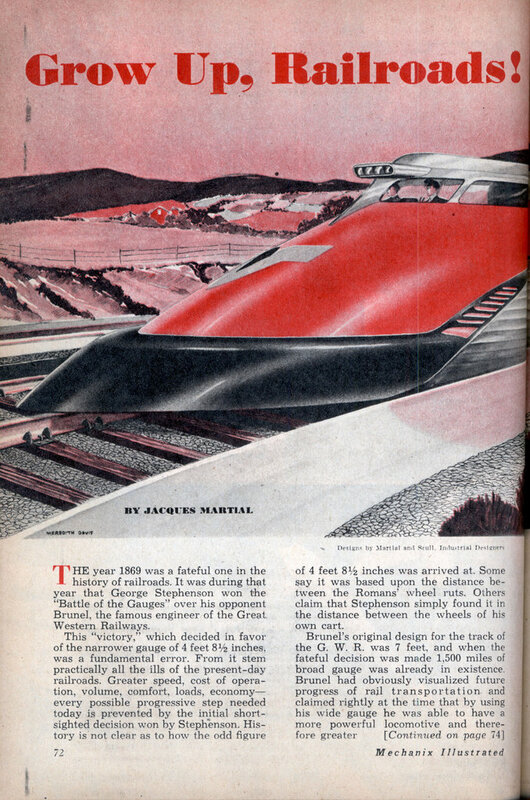 On American railroadsâ€”without doubt the best and most efficientâ€”top speed has reached about 130 miles per hour. The cruising speed of the best light stainless steel trains is approximately 80 mph. This speed, which would have seemed fantastic to George Stephenson, is today slow compared with those of airplanes and is totally inadequate for the future development of the railroads. It is an inescapable fact that to develop modern railroads to fulfill present and future demands we need speed up to 250 mphâ€”and this can’t be obtained on the present tracks. Of course, to reconvert all our lines to a broader gauge would be costly and difficult, but it could be done under a progressive program. Conversion would have to be done on a national scale with Federal assistance. In order to develop our rail- roads to meet present and future needs we must do the following: 1, Complete the electrification of all the roads. 2, Widen all tracks beginning with one double track from North to South along the Atlantic coast and one from East to West on a central line. 3, Design and build rolling stock for high speed and greater service loads. The present steam engine is as antiquated as the old Wells Fargo coach. The diesel engine dominates at present but it can be widely improved. Tomorrow’s power is sure to be electricity created by numerous electric and atomic power plants. Railroad designers now have all their ideas compressed within a prison of 4 feet 8-1/2 inches and cannot escape. All they can attempt is what they have been trying latelyâ€”vertical expansion, which means the double decker. But where does this lead us? Straight to speed reduction! It is no solution at all. Let’s have a look at the new designs needed for high-speed trains. First, we must have a rail gauge of something like 10 feet with a 3-rail track. Reenforce-ment of the road-bed may be necessary, or the rail itself may be made biggerâ€” 10 to 12 inchesâ€”to carry the heavier loads. The line should be as straight as possible, with inclinations proportionate to the new high speeds. 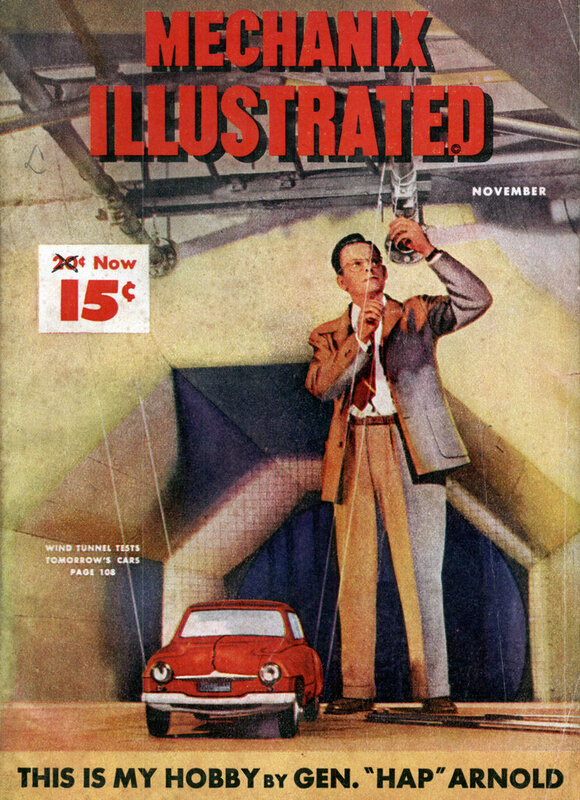 The present car height should be reduced from 13 feet to about 11 or 11-1/2. The present 40-inch wheel could be retained if technical improvements are made. Roller bearings must be used, and strength added. The car floor should be lowered from four to about two feet above the top of the rails, which means it will have to rise above the trunks; this will be but a small inconvenience to passengers, however, if the rise is graded smoothly. By lowering top and floor we lower the center of gravity. Also, lowering the top permits the proper speed line. The width of the car could be then increased to 18 feet at the base and tapered to approximately 13 or 13-1/2 feet at the top. The front of the engine would be given a graded slope at least 16 feet long in order to bring increased pressure to bear on it and so keep it firmly on the rails at high speeds. Such a car would have a serviceable inside width of 18 feet, eight more than the present ones. Travel by rail would have comfort and luxury like that on crack ships.